Artist Michael Wm. 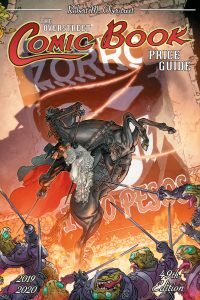 Kaluta turns his attentions to El Zorro, the Fox, in celebration of the character’s 100th anniversary for the cover of the Hall of Fame edition of The Overstreet Comic Book Price Guide #49 from Gemstone Publishing, which will be featured in the April 2019 PREVIEWS from Diamond Comic Distributors. The book is scheduled to go on sale Wednesday, July 17, 2019….